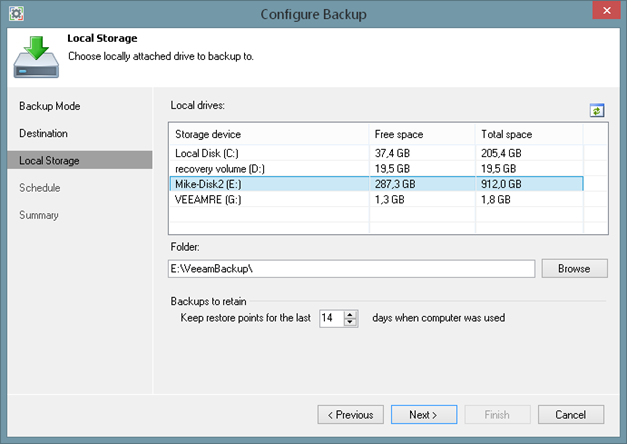 In this post we will go more in depth about the different scheduling and backup targets that you can use with Veeam Endpoint Backup FREE. In the previous post we talked about the different backup modes and now we continue in our backup wizard. Whenever we take a backup, we need to store it somewhere. Most people will have a specific preference for storing their backups and Veeam Endpoint Backup FREE supports a variety of options to meet your preferences or demands. This option gives you the possibility to choose between local disks or removable devices such as USB drives or FireWire drives. When you use USB removable devices as a backup target, you also have the option to rotate such devices. It means you can use different devices to make sure you always have a backup available somewhere. Please note that this will create a different backup chain on each device. The backup chain will be discussed in a later post. But for now, you need to know that it means you will have one full back up on each device, and all the others will be incremental ones. 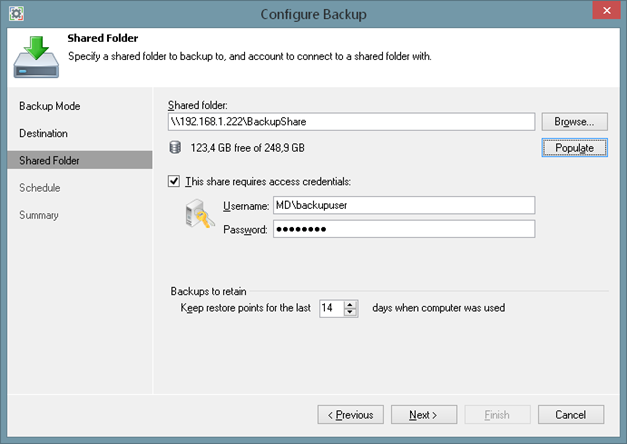 Saving your backups to a shared folder is another option you have. This could be a shared folder on your company’s fileserver, a home NAS device or any other solution you use for sharing the data around internal network. If the folder requires access credentials (username and password) for the specified destination, check the box “This share requires access credentials” and type in the needed information. If you have a Veeam Backup & Replication server in your infrastructure and you want to save your endpoint backups to the Veeam Backup and Replication repository, then this is your option of choice. It will enable a lot of additional functionality for the IT administrators to keep control of the backups of the endpoints. We will go deep into this functionality in another post. To configure this target, you need to specify the Veeam Backup & Replication server and potentially specify your personal credentials. The next step will be to choose the repository where the administrator gave you access to. Bear in mind, repository permissions are granted at the Veeam Backup and Replication console, but Default Backup Repository is enabled from start for evaluation purposes. 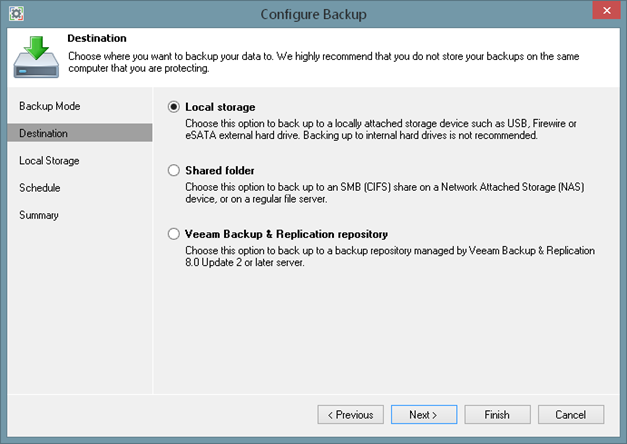 Note that you need at least Veeam Backup & Replication v8 with Update 2 to take advantage of this functionality. One of the things you might have noticed on each screen is that there the possibility to decide on your retention. Restore points are not kept forever -they are removed according to the retention policy. 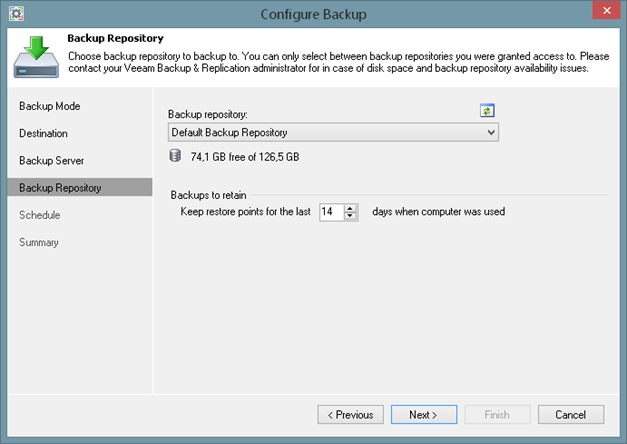 The retention policy in Veeam Endpoint Backup FREE might be a little bit different then what you are used to. When choosing your retention policy in X days, we don’t take calendar days in consideration, but the amount of days when there was at least 1 successful backup. Let’s say your retention policy is 5 days… It means you can have 3 backups (let’s say Monday, Tuesday, and Wednesday) but because you didn’t work or any other reason your computer is off for Tuesday and Friday. Saturday you have a new backup and Sunday also. At that moment, you have 5 days of backups (although it are 7 calendar days.) When the next backup runs (let’s say on Monday again) the first recovery point will become obsolete. Veeam Endpoint Backup FREE delivers different possible targets to store backup file in any location of your choice. It could be a local disks, removable devices, shared folder or Veeam Backup and Replication repository. The last option will also give you additional functionality that you can use for your endpoints.